Successfully Added GSM Relay Controller - Quad Band GSM, Support 64 Authorized Numbers, No Call Fees (Blue) to your Shopping Cart. 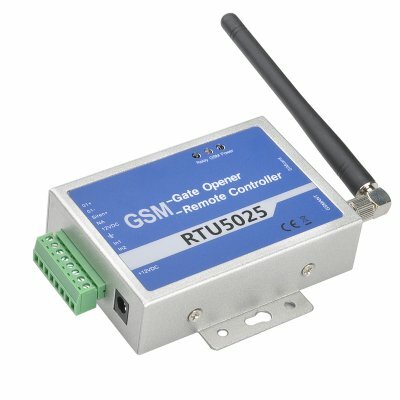 The GSM gate opener can be used for authorized door access, controlling gates, shared car parking, remotely switching on or off equipment and much more. This compact remote gate opener operates on GSM cellular frequencies so unlike remote controls can be used from almost anywhere, even another city or state. This means you can control access for workmen, visitors or deliveries while your away. Its simple and easy to set up with a simply relay that activates the open command or acticvation button for gates, bollards, automated machinery, garage doors and more. If the GSM Controller recognizes the number of the caller from its stored known numbers then it rejects the call and instructs the gate or door to open or close. If the umber isn't recognized then no action will be taken. There will be no call costs as the GSM gate opener rejects or ignores calls so the only fee you will face is for keeping an active SIM card. It can be installed and used in any location that is covered by one of the 850/900/1800/1900MHz GSM frequencies with a supported SIM card installed. This low cost solution for securing your assets and controlling gates, bollards, barriers, garage doors, shutters, access doors or machinery and can store up to 64 authorized numbers so its ideal for shared facilities as well as private property. This GSM Controller comes with a 12 months warranty, brought to you by the leader in electronic devices as well as wholesale security gadgets..